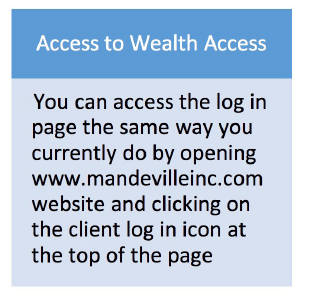 Mandeville Private Client Inc. is pleased to provide you with the "NEW" Wealth Access Client Portal. 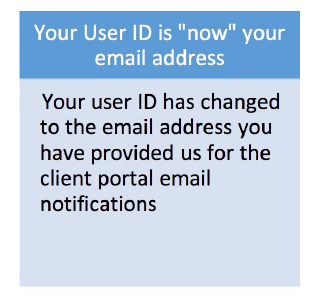 We are making this change in order to better serve you, as well as creating a foundation for additional services and enhancements in the future. 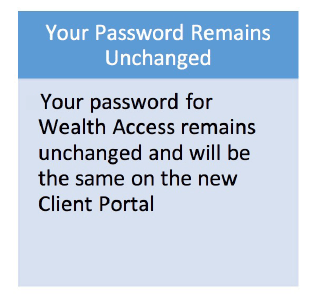 This brochure contains important information you will need in order to access the new Wealth Access client portal. Upgrading Wealth Access will set the foundation to better serve you. The Overview page will provide a summary of your Mandeville accounts. The illustrated pie chart allows you to choose the set up of the graph: by asset mix, currency or accounts, it’s your choice. Click the dropdown arrow under "My Portfolio" section in order to expand the listing of your Mandeville accounts. The left panel allows you to toggle between the following web pages: Overview, Holdings, Fees, Transactions, My Documents and General Documents. Just click on the panel option you want to view. By clicking on the settings symbol you have the option to change your preferences, language, password or to logout. The General Documents section will contain important Mandeville client resources; you have the option to download or to view. Monday to Friday 9a.m. to 5p.m.